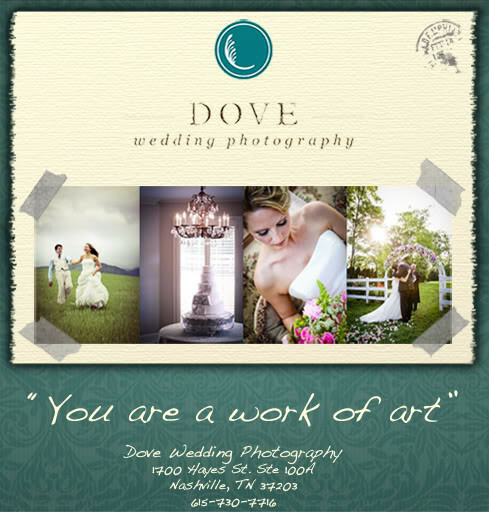 As some of you may know earlier this week I did an interview with a local wedding photography company, based here in Nashville, called Dove Wedding Photography (if you missed the interview click here –> http://doveweddingphotography.com/2011/03/15/vendors-we-love/an-interview-with-brittainy-from-britts-beauty-bag/ ) as their beauty guru giving helpful tips and tricks for brides and grooms to be! As a result of that interview I found out that not only do they create magnificent wedding photos they also offer photography classes for beginners ,to help you learn your way away around the camera & for the person who knows a little bit about the camera but wants to enhance their skill level. Make sure you check out http://www.doveweddingphotography.com Their body of work is truly amazing and they will tailor your shots to fit each couples individual style! « Toothbrush On Your Face?